These iChat 1 pages are coloured Blue and have the iChat 1 icon on them that was in use at the time, so you know where you are. This is the Bottom of the Buddy List in iChat 1. The Bottom of the iChat 1 Buddy List has different icons for things compared to the later versions. Firstly they are all on the left. The right hand one that is a Speech Bubble with an exclamation mark in it will go dark when a Buddy is highlighted and you can then use it to Start a Chat. The next left will do the same but you can Email someone (If they have an email address in your Address Book). The next left (and to the right of the green arrow), the "i" icon, is a point to access the Info Card for a Buddy. It has a drop down at the top and contains several panes. The Default one is this Address Card info. You can use this to Edit a Card. 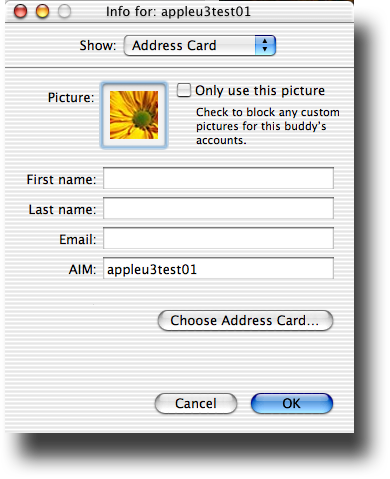 Adding First and Last names (Or putting any detail in there) will create an Address Book entry as will adding an email. Once you have used this it will return to the pane that you last used when you use the Info Card again. 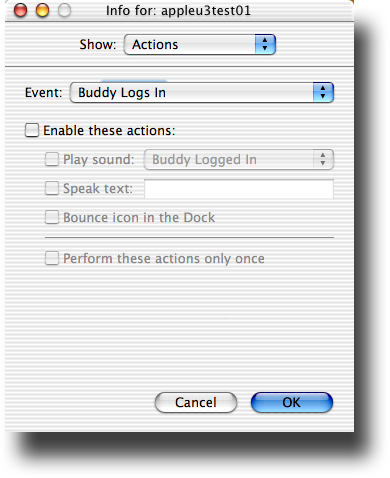 It can also be accessed by doing a Right-click (Control-click) when a Buddy is highlighted and a menu pops up (Get Info). I just happen to have done this on a Buddy near the bottom of the list. One of the other Panes is a place to set Sound to Actions for that Buddy only that can be different to the ones Globally set in the Alerts Preferences. This works fine through iChat 1 to iChat 3. iChat 4 seems to have a problem with doing Global Sounds and Individual Sounds on the same actions which is worth remembering if you Upgrade or regularly switch between iChat versions whilst using other software that cannot be upgraded for Leopard. There is one more option in the drop down. The last pane is about keeping your own Notes and seeing the AIM profile of the Buddy. 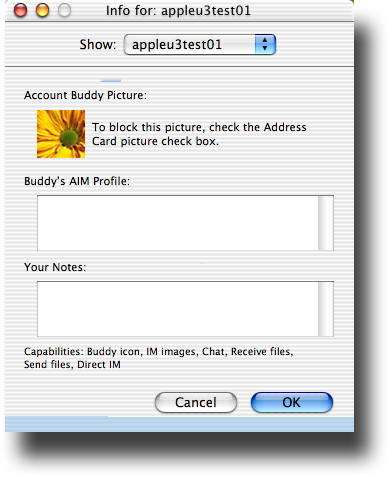 iChat 1 does not have a method of you accessing your own AIM Profile and writing it but it will display other peoples (if they have one and this Buddy does not). The two boxes will become scrollable if the details are longer than the area shown. Quite important is the Info under the Notes area. These details are the capabilities of your Buddy. If you are having trouble Sending files for instance it is worth checking here that they can receive them. The second from the left and highlighted by the Green Arrow is the Button/icon to press in the Buddy list to start the Add Buddy process. To be honest I have forgotten what the far left button does. The Bottom of the Buddy LIst and the icons there, what they do and some of the pane/window that can be seen from there.